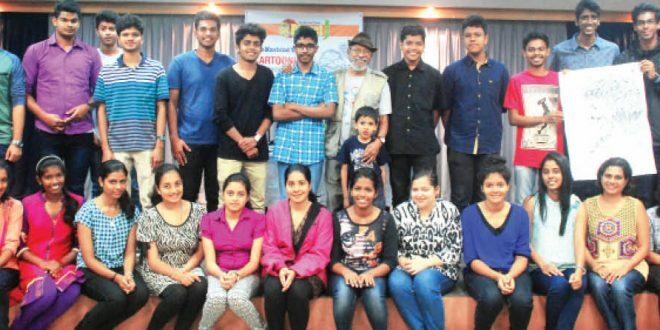 “This is not a workshop but a funshop,” declared Gos’s most-loved cartoonist Alexyz; as he addressed the participants at Planet J’s cartooning workshop at Dempo House, Panaji. The half day workshop which aimed at giving participants tips on creating caricatures that were not just funny but also thought-provoking was held on Sunday, February 28 and was open to those between ages 16 years and 25 years. However parents too wanted to participate and were welcomed along with six-year old Athan who was the youngest participant. Alexyz had planned the workshop with fun as the main component and to prove it, he started with laughing exercises. Hasya yoga which he practices himself, he said, is very important to get into the mood of drawing caricatures. The participants were initially shy but by the third round were well into it and laughter could be heard throughout the building! Alexyz then spoke about his journey as a cartoonist and also mentioned Shankar Pillai, India’s premier political cartoonist. He also spoke about different types of cartoons and a career in the field. At every point he encouraged participants to interact and have fun. For nearly twenty minutes, Hemant posed patiently and participants could be seen frantically working at their creations. Each and every caricature that the participants produced were amazing and their creativity and talent could be clearly seen. The best representation was by Savni Pai Panandikar and she was presented with a prize by Alexyz. The workshop ended with certificates of participation being handed out by Alexyz. With the curtains down on this one, The Navhind Times is gearing up for its next workshop so keep yourself informed!